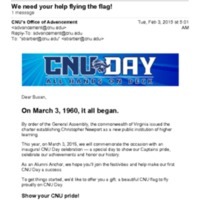 2.2 O We need your help flying the flag! 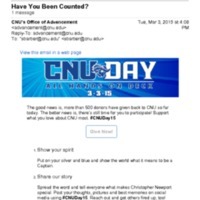 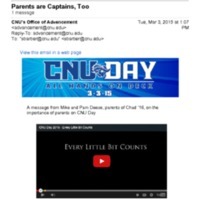 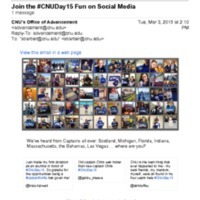 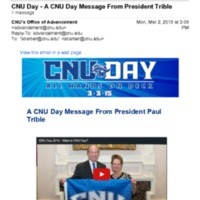 An email providing examples of CNU Day on social media. 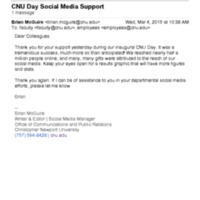 2.2 O Have You Been Counted? An email announcing that more than 500 people have given donations during the CNU Day campaign. 2.2 O Hail, All Hail to CNU! An email thanking donors. It also provides the CNU alma mater and a ringtone that can be dowloaded.